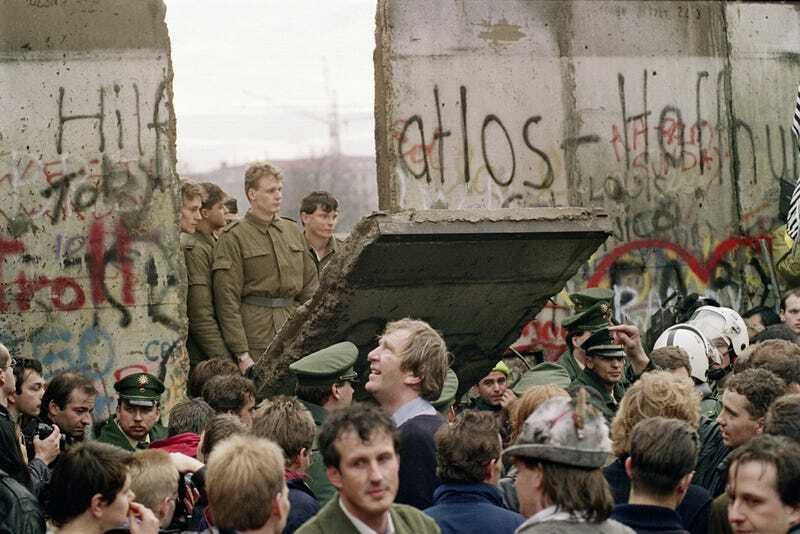 It's been exactly 25 years since the wall came down and Berlin—a city that was once the epicenter of a worldwide ideological struggle—took its first, daunting steps toward reunification. Despite all odds, the graft took. And today the scar the wall left is so faint that unless you know what to look for, it's practically invisible. "I have young Berliners ask me all the time if we're standing in former West or East Berlin," Stefan Wolle, the chief historian of Berlin's East German DDR Museum, told me. "Especially for the young people here, I feel that reunification has completely finished." But while the city's Cold War fault-line may have healed, the city has by no means lost its geopolitical relevancy. Today, united Berlin stands as a center of another global ideological struggle—the revolt against online surveillance. In the shadow of the fallen wall, Germany's capital has grown into one of the largest and most vibrant meeting points of politically-minded hackers, whistleblowers, and pro-privacy advocates anywhere in the world. It is not only the adopted home of international anti-surveillance figureheads like journalist Laura Poitras (the first of Edward Snowden's collaborating journalists), Tor's Jacob Appelbaum, and Wikileaks's Sarah Harrison, but is also the headquarters of the politically-active Chaos Computer Club—the world's oldest and largest agglomeration of hackers. Thanks to Berlin's voters, the nation's Pirate Party recently had seats in the German senate, and perhaps the most telling, Berlin is a city almost universally enamored of Edward Snowden. Ask the right people, it becomes clear that Berlin's Cold War past and cyber rebellious future are deeply intertwined. Here's why. For anyone acquainted with the history of divided Germany, the average Berliner's sympathy for the fight against public surveillance should come as no surprise. At its height, East Berlin was "the headquarters of a surveillance state still without parallel in the modern world; with perhaps the exception of North Korea," said Wolle. The Stasi—the moniker of the East German secret police—coerced an absurd number of state's 16 million citizens into becoming agents and informers. By 1989, a full one in 166 East Germans were Stasi agents, with far more people forming a vast network of secret informants. Ears were everywhere, and the right accusation could end in a death sentence. "You were always wondering who around you was with the Stasi," Wolle said. "It was like a disease of paranoia." According to Annie Machon—an antisurveillance activist, part-time Berliner and former MI5 agent and whistleblower—this fact alone has made Berlin an attractive home and exile for pro-privacy activists and whistleblowers for decades. "There's a historical awareness here for what it's like for constant surveillance to be a fact of everyday life. It's practically engrained in the buildings," Machon told me, "and not just because of the Stasi, but also because the knowledge of what happened in the 1930's after the slide into Nazism." "So for people like me or Sarah [Harrison] or Jake [Applebaum], one of the benefits of coming to Berlin is that you don't have to start explaining from the baseline why these issues of privacy and surveillance are important to a functioning democracy," she said. And unlike her homeland in the UK (or the United States,) argues Machon, the history of repressive regimes also means that Berliners are inherently more skeptical of the hidden actions and motives of their secret service, because "you just don't have the same James Bond, good-guy spy mythology." Berlin's placement as a central node in the struggle against online surveillance has also been buoyed by its thriving and rapidly growing tech sector and hacker scene. The sense of IT community in Berlin is remarkable, thanks chiefly to the Chaos Computer Club and the endless litany of speaking events, hackathons, and get-togethers. The thriving scene is helped by Berlin's central location in Europe, and perhaps most importantly, as Lindenberg explains, it's very easy for these people to move to Berlin because the housing and general living expenses are almost ridiculously cheap. Since the fall of the wall, artists and techies have swarmed into former East Berlin neighborhoods—or poor, isolated districts in West Berlin, such as Kreuzberg and Neukölln—which were largely abandoned under communist rule. (It's worth noting: Berlin's current population is still roughly 1 million lower than it was in 1939.) And even 25 years later, the housing market is far from saturated—it's entirely possible to rent a room in one of these grungy-but-trendy neighborhoods, and pay less than $300 a month. But many tech workers, hackers, and entrepreneurs found their way to Berlin in pursuit of the same ongoing political dialogue that has drawn in activists and whistleblowers. "In comparison to other tech hubs, there is a very large sense of political relevancy here," said Friedrich Lindenberg, a freelance coder and data journalist in Berlin. "People here are not just focused on making iPhone apps or moving data around faster. They're thinking about how you can use the web as a tool to reinvent democracy. And that's a discussion that is not happening anywhere else." But while Berlin may house the largest grassroots antisurveillance community in Europe, according to Mark Worth—a whistleblower activist and former director of Transparency International's whistleblower program—the city is still by no means an Eden for privacy nor a political haven for German whistleblowers. Worth points to the public outrage around NSA spying on German chancellor Angela Merkel's cell phone, and the calls from German politicians and German newspapers for "Asyl für Snowden" (read: Asylum for Snowden) and sees "a great hypocrisy." Not only has the BND (the German counterpart to the NSA, which is partially headquartered in Berlin,) been repeatedly shown in document leaks to have collaborated with its U.S. partners by providing data on German citizens, but thanks to its archaic civil code and history of political corruption, Germany is actually the worst country in Europe for the protection of whistleblowers. "It's is on par with Indonesia or Saudi Arabia," says Worth. Had Snowden been a Berliner (naturally: Snöwden) revealing secrets about the BDU's unconstitutional surveillance, he would have been equally without hope within Germany's legal framework. Yet, in spite of Germany's own record of surveillance, and the nationwide difficulties faced by would-be whistleblowers, Berlin nonetheless continues to grow and evolve as an important, ideological home for antisurveillance proponents. Especially today, it shouldn't be surprising. After all—as we are reminded on the anniversary of the fallen wall—Berliners, when placed on frontlines of ideological war, fight for what they believe in.